Vehicles make their way toward Boston on the Massachusetts Turnpike. Commuting into Boston on any given weekday involves military-style strategic planning to gain the upper hand over thousands of others trying to get to the same area at the same time. For many commuters trying to get into the Boston area by 9 a.m. from points north, south, or west of the city, it is common knowledge that if you’re not on the road by at least 7:30 a.m., you are likely going to be late. If you live in Boston itself or a neighboring suburb, perhaps you can get away with hitting the road by 8 a.m. Many of those commuting by public transit would attest to the same challenges. If measured by hours spent in traffic gridlock, commuting to the Boston area is as bad now as it was a decade ago, according to the 2015 Urban Mobility Scorecard, an annual report published by the Texas A&M Transportation Institute. 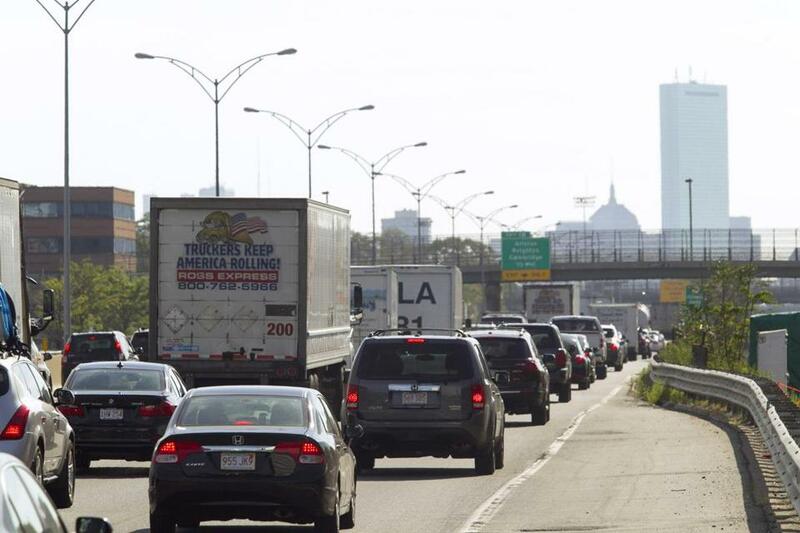 Read: Who can claim the worst Boston commute of all? Boston is the sixth-worst metropolitan area for traffic congestion nationwide, with the average commuter spending 64 hours stuck in traffic last year, according to the report. That’s up from 63 hours in 2013, and tied with the peak number of hours drivers wasted in prerecession 2005, when the Big Dig was almost complete and marketed as the solution to gridlock for commuters. Later highway analyses would conclude that the added capacity attracted more drivers, and pushed the traffic bottlenecks farther into the suburbs. 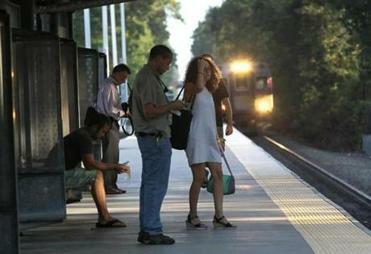 It’s no wonder, considering the daily travel volume into Greater Boston’s core communities. Approximately 787,000 people commute each weekday into Boston and large employment areas in nearby Brookline, Cambridge, Chelsea, Everett, Malden, Medford, Revere, Somerville, and Winthrop, according to an analysis of 2012 travel patterns by the Boston Region Metropolitan Planning Organization . Most of those commuters, 71 percent, drive into the area. By contrast, the average weekday inbound ridership on commuter trains, 66,244 boardings in fiscal year 2013, is only a slight increase from the prior year, and it is lower than the average peak of 74,267 daily weekday riders in fiscal 2009, according to a report released last year by the Massachusetts Bay Transportation Authority. While traffic congestion may mirror that of a decade ago, the same cannot be said for the shifting attitudes of the average commuter, who would prefer to have more options for getting into and out of Boston, said Josh Ostroff, partnerships director for Transportation for Massachusetts, a statewide advocacy coalition. The three areas that have seen the most workforce growth in recent years — Kendall Square in Cambridge, and the Longwood Medical Area and the Seaport District in Boston — have “inadequate transportation networks to get people to work,” Ostroff said. During the past decade the focus to address congestion has also shifted away from expanding highways to addressing safety concerns and bottlenecks at local intersections and along traffic corridors, said Eric Bourassa, transportation director at the Metropolitan Area Planning Council. In its Long-Range Transportation Plan report, the Boston Region Metropolitan Planning Organization stated that intersection safety continues to be an area of emphasis for improvements, including at high-crash-volume locations such as Route 9 in Natick and Framingham, Route 18 in Weymouth, and Route 107 in Lynn. Commuter-rail parking lots that are at capacity and an increase in bus ridership point to a growing preference among suburban residents to leave their cars and take public transportation into the Boston area, Ciaramella said. Dennis DiZoglio, executive director of the Merrimack Valley Planning Commission, said while commuter-rail ridership remains steady north of Boston, demand has skyrocketed for bus service into the city. Last year, the Merrimack Valley Regional Transit Authority’s commuter buses carried 63,000 passengers, an increase from 44,000 in 2010, DiZoglio said. Still, DiZoglio said, the preferred commuting mode into Boston from points north, including from southern New Hampshire, continues to be the automobile. A significant shift to public transit will come only with increased and consistent commuter rail service, he said. Even then, driving will continue to be the most common mode of travel into the Boston area until at least 2040, with daily highway trips projected to increase, according to long-range transportation forecasts in the Boston Region Metropolitan Planning Organization report. But commuters should take heart that in the future, “We will see a better balancing of travel modes, so that the highway projects will be evaluated more fairly alongside transit, cycling, and pedestrian,” said Ostroff, of Transportation for Massachusetts.